Understanding therapy adherence and its factors is an important part of managing healthcare costs and improving patients’ health outcomes. Leveraging the Cox Promotional Hazard Model and health claims data can aid in identifying the ‘risk factors’ to staying on the treatment over time, and inform optimized and efficient resource deployment strategies. This article will review the methods often utilized for adherence evaluation, as well as introduce a case study, assessing the factors driving adherence long-term. Patient adherence to therapy is an essential part of improving patient health outcomes. Non-adherence to therapy can increase healthcare costs in the long term, as it can lead to increased comorbidities and concomitant therapies, as well as decreased quality of life. It is estimated that the economic cost of non-adherence to treatment is at 100 billion to 300 billion dollars.1 This cost includes lost wages, which result from increased disease burden, in addition to the cost of the avoidable health care. Understanding not just the current level of adherence within a population, but the factors, which impact adherence, are an important part of managing healthcare costs. This article will review the currently leveraged measures of adherence, and the ‘Whys’ driving patient’s continuation on the prescribed treatment. It will also discuss a case study, assessing adherence and its drivers. Patient adherence to treatment is important to improving patient outcomes. There are a few standard measures of adherence, including Medical Possession Ratio (MPR), Proportion of Days Covered (PDC), Refill Compliance Days (RCD), Continued Measure of Medication Gaps (CMMG), Medication Refill Adherence (MRA), and Duration of Therapy (DT), to name a few.2 The most often employed approaches to measure adherence include MPR and PDC metrics. PDC, on the other hand, allows for the assessment of adherence when concomitant therapies should be taken into consideration. It is better suited for therapeutic areas where treatment switching and multiple-medication use is common.3 Multi-therapy treatment often occurs in the oncological and immunological therapeutic areas. While these measures inform whether the level of adherence to treatment is within a given range for a given population of patients, they are static measures, which do not provide insights into the factors which are contributing to adherence within a particular patient population. Working with the primary market research data may sometimes result in a limited ability to collect in-depth information on behavior-based topics of interest or track the actual behavior of the respondents. As a result, it is often recommended to leverage secondary data to help provide additional insights not captured in the survey based approaches.10 For example, actual patient history available from health claims data can be included in analyzing adherence to medical treatment to provide more comprehensive and detailed insights into the patient treatment journey to accurately measure and estimate the impact of selected drivers on the length of staying on the therapy. More detailed information about health claims data will be provided in a later section of this article. In this article, the Cox Proportional Hazard Model is discussed as an approach to study adherence of medical treatments. The technique can be leveraged to identify drivers of adherence otherwise known as ‘risk factors,’ and the level of impact healthcare variables have on patient adherence to treatment. In this article, the Cox Proportional Hazard Model is introduced for estimating the impact of ‘risk factors’ on drug adherence. The benefits of the model include capturing time variance, which allows modeling of not just the overall impact of an event, but the impact that the event has over time based on its timing relative to other events. This ensures that the ‘risk factors’ probabilities and their associated impacts account for the time dynamics on adherence. Inclusion of time allows for the estimation of the probability of adherence at a selected point in time, while taking into account the impact of multiple factors.13 The concept of time varying covariates in the survival model is presented graphically in Figure 1.
logλ(t|z1) λ(t|z0) = ( z1 −z0)Tβ, for all t ≥ 0.
logλ(t|zk + 1) λ(t|zk) = log(λ(t|zk+1))−log(λ(t|zk)) = βk. λ(t|zk + 1) λ(t|zk) =eβk, for all t ≥ 0. Probability [t ≤ T<t+∆ t|T ≥ t,zk + 1] / Probability [t ≤ T<t+∆ t|T ≥ t,zk] ≈ eβk, for all t ≥ 0. Using health claims data is often recommended for adherence modeling and finding ‘risk factors’ for staying on therapy long-term. For the purposes of this article, data for billing purposes (e.g. CPT and ICD 9/10 codes) is introduced along with medication (NDC codes) consumption in the healthcare claims bundle. 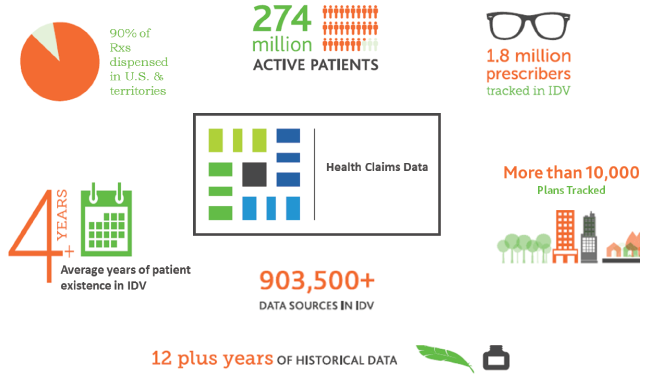 While alternative data sources, such as clinical data (electronic medical or healthcare records (EMR or EHR), and medical images), lab data or genomics data and behavioral data are all readily available, the volume, variety, velocity, and veracity might not be present in alternative data sources.16,17,18 Examples of data assets available in the healthcare industry for analysis are shown in Figure 2. Although there are many benefits to using health claims data as presented above, the data might not always fully capture patients’ medical history, due to the differential rates of capturing medical claims or a lack of reporting of laboratory test results. For example, hospital claims usually have low coverage rates of rendered services and might include inconsistent reporting formats, which impact the ability to track in-patient treatments and the linking of other data sources to out-patient treatment after hospitalization.21 The differentiated capture rates of therapies, especially for infused and injectable drugs, might also result in small sample sizes, especially for rare and orphaned disease therapies, which might cause difficulties in studying those therapeutic areas in-depth. Product A is a leading branded treatment in the therapeutic area. There is also a generic version of the product, accounting for more than 80% of the market.25 Marketing leaders would like to understand the positive and negative drivers of adherence to ensure efficient and optimized allocation of resources to drive the brand’s maximum performance in-field. To measure patient adherence for a key branded drug, called Product A. To understand the ‘risk factors’ impacting patients staying on the treatment over time. The case study leverages patient level health claims data, as well as the Cox Proportional Hazard Model to identify ‘risk factors,’ and the associated level of impact of healthcare variables on patient adherence for Product A.
Cox Proportional Hazard Model is leveraged to estimate the impact of covariates on drug adherence, defined here as the ‘risk factors’ to discontinuing Product A. Less than 1, implies that the covariate decreases the risk for discontinuing Product A. Greater than 1, implies that the covariate increases the risk for discontinuing Product A. Risk Probabilities that are provided in absolute values, and their direction is noted by the accompanying Relative Risk Ratios. The probability values represent the percentage increase or decrease in risk for therapy discontinuation. The predictive analytics results, leveraging the Cox Proportional Hazard Model, suggest that the following ‘risk factors’ are important at the minimum of 90% CI in driving adherence or as defined in this study the risk of discontinuing Product A over time. As shown in Table 1, there are several ‘risk factors’ impacting adherence for Product A (or increasing the risk for discontinuing Product A): plan changes, gender (F), medication burden, out-of-pocket costs, as well as selected comorbidities, including mental health diagnosis. These results are consistent with previous empirical research, studying the impact of covariates on staying on therapy long-term. For example, in her article, Fullman found that medication adherence levels increased with third party co-insurance payments, while decreased with a higher cash burden accrued by patients.7 In addition, mental health and specifically, depression diagnosis, was also found as one of the strongest predictors of patient non-adherence to medical treatments.6 In this study, mental health diagnosis increases the risk for Product A discontinuation by 29%. In this case study, the highest impact of ‘risk factor’ driving non-adherence are changes in insurance plans. As health claims data spans across multiple insurance plans, it often allows us to investigate the price elasticity of prescribed treatments, and the impact of local managed care organizations on patient treatment choices compared to national-footprint plans. Results of such studies can aid revisions in contracting with MCOs to improve coverage, and therefore patient adherence long-term. Other covariates of interest were also included and analyzed in this case study, but they were not found statistically significant at the 90% CI. For example, patient education and income levels were not statically significant in driving Product A’s adherence. Previous empirical studies present mixed results on the impact of socioeconomics variables on non-adherence, with some citing significant impact while others implying a limited correlation. The results usually are dependent on the homogeneity of the studied population, and the therapeutic area of interest.30,31 Furthermore, blood tests, often performed to monitor progression of the condition, did not impact staying on therapy long-term either. Other empirical studies cite, however, that frequent blood testing is a good measure of chronic disease progression monitoring and optimizing patient treatment, while increasing drug adherence.32 The insignificant results might suggest the need for tracking the test outcomes to inform changes in the treatment from disease progression, which may in turn lead to increased patient adherence. Leveraging the survival analysis model provides the opportunity for realizing additional insights into not only the adherence level for Product A, but the marketing and sales strategies, as well as programs that could help lower the probability for non-adherence. Understanding the key drivers and their associated impacts on non-adherence can aid in driving brand success in an efficient manner over time, while greatly impacting patient outcomes via improved compliance and adherence. For example, knowing that mail order deliveries of medications increase patient adherence may lead to extension of the programs, while ensuring patient convenience in refilling their medications. The primary limitation of the study is leveraging only health claims data and not accounting for other factors related to the patient’s treatment journey, including laboratory results. Understanding in-depth the progression or sub-type of the disease might add significantly to the evaluation of drivers of adherence. In addition, including more information related to patient cognitive abilities in comprehending the prescribed treatment dosing and schedule recommendations, as well as understanding patients’ perceptions of the prescribed treatment, disease progression, and seriousness of the condition, may also provide an additional explanation for the adherence levels, as well as its drivers and barriers. As mentioned in the earlier section of the article, linking other datasets, including primary market research information, EMR, and genomics, might further define and help evaluate the drivers and ‘risk’ factors of patient adherence via presenting a more comprehensive view of patients and their experiences on the prescribed therapy. Furthermore, the data may allow investigating the health and economic outcomes of therapy, as well as evaluating how the current sales and marketing strategies and tactics, as well as other programs implemented to increase patient education and adherence, drive the desired outcomes. These results could inform an optimized and efficient allocation of resources to maximize desired health outcomes. Finally, future developments and direction in this research area may lead adherence assessment into leveraging other analytics approaches, including exploratory machine learning algorithms, in order to increase predictive accuracy of the survival models. Through the use of social media data and natural language processing, additional insights might also be gained into the more ‘personal’ effects currently not captured in health claims data. The authors would like to thank Hanna Socaciu for her assistance in writing this article, as well as the anonymous reviewers for their valuable comments and suggestions to the publication. Ewa J. Kleczyk, PhD is an Executive Director of Commercial Effectiveness Analytics with Symphony Health Solutions, with experience in primary and secondary market research and marketing analytics for pharmaceutical clients. Derek Evans is a Senior Vice President leading the Commercial Effectiveness Practice at Symphony Health Solutions, with experience in primary and secondary market research, marketing analytics and strategic consulting for pharmaceutical clients. 1 Iuga AO, McGuire MJ. Adherence and Health Care Costs. Risk Management Healthcare Policy. 2014; 7: p. 35-44. 2 Sudeep K, Cleves MA, Helm M, Hudson TJ, West DS, Martin BC. Empirical Basis for Standardizing Adherence Measures Derived from Administrative Claims Data among Diabetic Patients. Medical Care. 2008 November; 46(11): p. 1125-1133. 3 Nau D. Proportion of Days Covered (PDC) as a Preferred Method of Measuring Medication Adherence. Article. Springfield, VA.
4 Beena J, Jimmy J. Patient Medication Adherence: Measures in Daily Practice. 2011 May; 26(3): p. 155-159. 5 Mann DM, Howard D, Ponieman H, Leventhal EA. Predictors of Adherence to Diabetes Medications: The Role of Disease and Medication Belifes. Journal of Behavioral Medicine. 2009; 32: p. 278-284. 6 Martin LR, Williams SL, Haskard KB, DiMatteo MR. The Challenge of Patient Adherence. Therapy Clinical Risk Management. 2005; 1(3): p. 189-199. 7 Fullman P. The Drivers that Impact the Patient Adherence. PM360. 2012 October 1. 8 McKethan A, Benner J, Brookhart A. Health Affair Blog. [Online]. ; 2012 [cited 2017 January 10. Available from: http://healthaffairs.org/blog/2012/08/28/seizing-the-opportunity-to-improve-medication-adherence/. 9 Muller S, Kohlmann T, Wilke T. Validation of the Adherence Barriers Questionnaire - an Instrument for Identifying Potential Risk Factors Associated with Medication Related Non-Adherence. BMC Health Services Research. 2015; 15: p. 153. 10 What Researchers Mean by Primary and Secondary Data. A Quarterly Publication of the Institute for Work & Health: At Work. 2015 Fall; 82: p. 2. 11 Cox DR. Regression Models and Life-Tables. 1972; 34(2): p. 187-220. 12 Huynh KP, Voia MC. Mixed Proportional Hazard Models with Continuous Finite Mixture Unobserved Heterogeneity. [Online]. ; 2016 [cited 2017 January [Syracuse University]. Available from: https://www.maxwell.syr.edu/uploadedFiles/cpr/events/cpr/papers2016/voia.pdf..
13 Therneau T, Crowson C, Atkinson E. The Comprehensive R Archive Network. [Online]. ; 2016 [cited 2017 January 10. Available from: https://cran.r-project.org/web/packages/survival/vignettes/timedep.pdf..
14 Raghupathi W. Healthcare Informatics: Improving Efficiency and Productivity. In S K, editor. Data Mining in Health Care. ; 2010. p. 211-223. 15 Burghard C. Big Data and Analytics Key to Accountable Care Success; 2012. 16 Dembosky A. 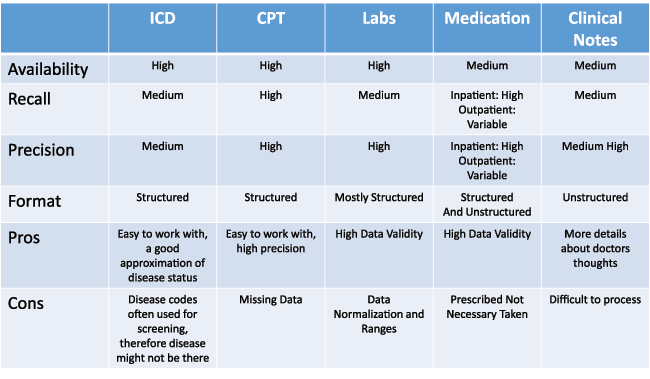 Data Prescription for Better Healthcare. Financial Times. 2012 December 12; 19. 17 Feldman B, Martin EM, Skotnes T. Big Data in Healthcare Hype and Hope. 2012 October. 18 Fernandes L, O’Connor M, Weaver V. Big Data, Bigger Outcomes. Journal of AHIMA. 2012;: p. 38-42. 19 Denny JC. Chapter 13: Mining Electronic Health Records in the Genomics Era. PLoS Computational Biology. 2012; 8(12): p. e1002823. 20 Symphony Health Solutions. [Online]. [cited 2017 January 10. Available from: www.symphonyhealth.com. 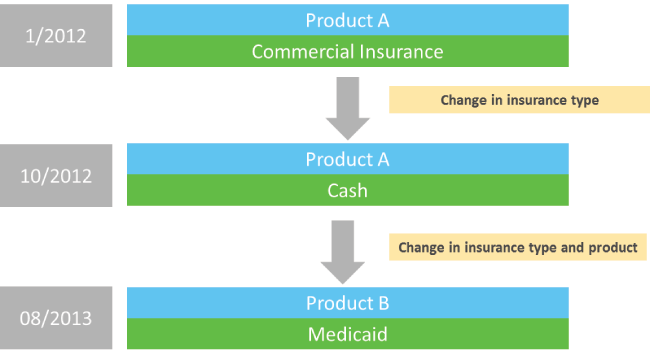 21 The Future of Health Insurance: A Road Map Through Change. Report; 2015. Report No. : CSG No. 1506-1546714 Northeast. 22 Big Data Analytics for Healthcare. In Tutorial Presentation at the SIAM International Conference on Data Mining; 2013; Austin, TX. 23 Emons M. Integrated Patient Data for Optimal PAtient Management: The Value of Laboratory Data in Quality Improvement. In Proceedings of the 24th Arnold O. Beckman Conference. ; 2001: Clinical Chemistry. p. 1516-1520. 24 Wilson J, Bock A. The Benefit of Using Both Claims Data and Electronic Medical Record Data in Health Care Analysis. White Paper. Eden Prairie, MN:; 2012. Report No. : 12-27912. 25 Maughn K, Kleczyk E. Assessing Adherence and Usage Behavior to Identify Product Usage among Chronically Ill Patients with Idiosyncratic Treatment Plans. In PBIRG Annual General Meeting; 2016; Bocca Raton, FL. 26	Ho PM, Bryson CL, Rumsfeld JS. Medication Adherence. Its Importance in Cardiovascular Outcomes. Circulation. 2009 June; 119(23): p. 3028-35. 27 Pearson C. Medication Adherence: Are Women Worse then Men at Taking their Meds? The Huffington Post. 2013 May 5. 28 Fendrick M, Chernew ME. Precision Benefit Design - Using “Smarter” Deductibles to Better Engage Consumers and Mitigate Cost-Related Nonadherence. JAMA Internal Medicine. 2017 January 7. 29 Iyengar RN, Lefrancois AL, Frazee SG. Association of Pharmacy Dispensing Channel with Medication Adherence Among Medicare Part D Patients Having Comorbid Conditions. 2014. Poster Presentation. 30 Billings ME, Auckley D, Benca R, Foldvary-Schaefer N, Iber C, Redline S, et al. Race and Residential Socioeconomics as Predictors of CPAP Adherence. Sleep. 2011; 34(12): p. 1653-1658. 31 Falagas ME, Zarkadoulia EA, Pliatsika PA, Panos G. Socioeconomic Status (SES) as a Determinant of Adherence to Treatment in HIV Infected Patients: a Systematic Review of the Literature. Retrovirology. 2008 February 1; 5(13). 32 White T. Stanford Medicine. [Online]. ; 2015 [cited 2017 February 15. Available from: http://med.stanford.edu/news/all-news/2015/04/adherence-to-blood-thinner-best-with-pharmacist-management.html.